After over 20 years of fighting for recognition and inclusion in the city’s waste management system, the organized waste pickers of Bogota finally saw their dreams come true when the Bogotá government issued them in March of this year their first payment for the collection and transportation of recyclable materials. It was the first time they were paid as public service providers to the city. This victory cannot be explained without looking back at the ongoing struggle of the Asociación de Recicladores de Bogotá (ARB) for waste pickers’ rights and livelihoods. Their strategies have included numerous legal claims, demonstrations, support from legal advocacy groups and communication campaigns to both prevent private firms from monopolizing waste management in the city and to be recognized as an integral part of that system. The strategic decision to use the judiciary system has proven to be a successful means of reaching these goals. Since 2003, the Constitutional Court has issued various resolutions and orders recognizing waste pickers as subjects of special state protection. The Court has also acknowledged that to overcome poverty and waste pickers´ vulnerability, municipal authorities need to recognize and remunerate them as service providers in the collection and transportation of waste, and that attention should be given to the strengthening of their organizations and their entrepreneurial potential. The development of a census of waste pickers in Bogota to define who will benefit from these policies. A post-census process will need to be put in place to incorporate people who were excluded. The development of a campaign for waste separation at source. Waste pickers would be in charge of collecting these recyclable materials. The certification of private warehouses where materials submitted by waste pickers would be officially weighed and registered. Access and inclusion to simple banking services for waste pickers, under which all the people counted in the census and included in phase 1 of the initiative would have a personal bank account. Payments for services provided between December 12, 2012 and the end of February 2013 would be deposited in these accounts. Payment to the 790 – of the 4,000 incorporated into the newly established banking system – waste pickers on March 21, 2013. Payment was calculated at a rate of 87,000 Colombian Pesos (about $48 USD) per ton collected and transported and is equivalent to the rate paid to private operators for tonne of waste transported and disposed of in the landfill. 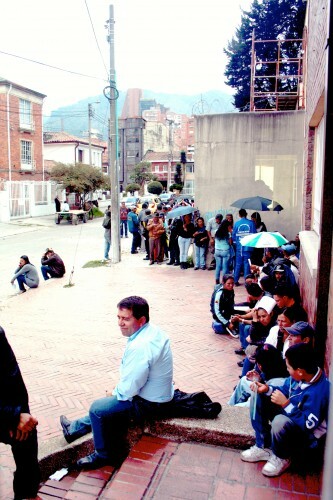 The money to pay for these services comes out of the cleansing fee charged by the city of Bogota. The only difference is that now instead of being directed in full to private or cleansing companies, this fee is shared as well with the service providers in the areas of collection and transportation of recyclables – namely, waste pickers. The process of inclusion is an ongoing one. To date, there are 14,400 waste pickers registered in the census. Further efforts need to be made to incorporate them into the banking sector, and to increase the number of official points to weight and register for the payment transfers. In addition, many waste pickers lack proper IDs. The District Capital Administration has begun to resolve this issue. Waste pickers’ organizational and entrepreneurial abilities to provide these services, as well as their due payment are key pathways in which municipal authorities seek to enable them overcome their poverty and vulnerable conditions. El 21 de marzo la alcaldía mayor de Bogotá realizó el evento de lanzamiento del sistema de pago a población recicladora por sus servicios de recolección y transporte de residuos reciclables. Foto: Federico Parra. In Bogota, the Mayor´s Office launched a payment system for waste pickers in exchange for their services collecting and transporting recyclable materials. An event kicking off the historic payments at city hall auditorium was held on March 21. Waste pickers´ leaders, independent waste pickers, city officials and the Mayor himself attended. There, the city government explained how waste pickers would receive payment for each tonne of collected and transported recyclables. With an automated teller machine in the middle of the auditorium, the mayor invited two waste pickers to demonstrate. Each one of them sent a text message with their mobile phones to the bank branch in charge of doing the transaction. Photo credit: Federico Parra. After going through security protocols, each received a PIN to claim their payment in any teller machine. Once they introduced their PIN in the teller machine, they received their payment. People burst into applause, jubilant shouts and even tears. “No more speeches! No more announcements!”—They shouted. Photo credit: Federico Parra. Many of them, still in shock, could not do anything other than repeat their thanks. However, the work that remains will be a challenge —the promise is to have all the 14,400 waste pickers in Bogota included into this system. The idea is also that in a few years waste pickers will be organized to provide collection and transportation services of recyclable materials, and that they will also receive (why not?) remuneration for the other environmental services they provide. Photo credit: Federico Parra.